Be the first to share your favorite memory, photo or story of Ofelia. This memorial page is dedicated for family, friends and future generations to celebrate the life of their loved one. 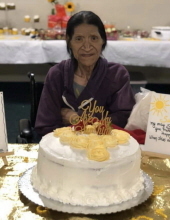 ☀️Ofelia Del Fierro our Sunshine ☀️ passed away peacefully at her home on Friday April 5th 2019. Ofelia was a wonderful daughter, sister, mother, grandmother, wife and friend. She had a heart of gold and always did for others when she could. She loved playing Bingo and cooking for her family. She loved spending time with her daughter Angelica and her grandchildren. Ofelia was a beautiful and patient soul who will be greatly missed by so many. She taught us how to be strong and how to be happy each and every day. Even through some of her toughest days she carried on her lovely sense of humor which we will miss each and every day. She was born November 17, 1955 to her loving parents Felipe and Maria Blanco. She later moved and grew up in San Antonio, Texas with 5 Blanco brothers; Felipe,Ricardo, Jesse, Alejandro and Pedro and 7 Blanco sisters; Guillermina, María, Petra, Magdalena, Hilda and Leticia. She was welcomed into heaven by her Mother- Maria Blanco, Father- Felipe Blanco, Brother- Felipe Blanco Jr, Brother- Richard Blanco and nephew Leroy Blanco. She leaves behind her loving children Joe Flores Jr, Wendy Casiano Flores, Cesar Del Fierro Jr. and Angelica Arango Flores and her loving husband Cesar Del Fierro. All her brothers and sisters and her loving grandchildren Luis A Arango, Bianca Arango, Karina Arango, Perla Arango, Eliana Arango, George M Calderón, Brian Emery, Joe A Flores and Carlos J Flores and Cassandra Hinojosa. To send flowers or a remembrance gift to the family of Ofelia B. Del Fierro, please visit our Tribute Store. "Email Address" would like to share the life celebration of Ofelia B. Del Fierro. Click on the "link" to go to share a favorite memory or leave a condolence message for the family.